Every year, for as long as I can remember, I've watched my Mum make her Christmas pudding. The fruit soaks for weeks in a mix of brandy and sherry in her white two piece tupperware container that she's had since she was married. It's the perfect size to hold the mix of sultanas and mixed fruit that's left to soak up the alcohol and plump to perfection. After the fruit soaked, the pudding process began. First the cloth is boiled in her big metal pudding pot that's only used once a year. The mixer is filled with butter and bread crumbs and sugar and flour and then finally the fruit mixture is added. Once the pudding cloth is boiled, she lays it out on the bench top and sprinkles it with flour, dumping the pudding mixture out of the mixer bowl and into the centre of the cloth ready to wrap it. When I was about 8, I became the helper. Mum would wrap the pudding up, twisting and tying it until it was just right and my little hands would grasp the cloth, holding it in place to Mum could carefully tie it with twine. As a child, this was the best job because it meant I "helped" to create everyone's favourite pudding. Mum's pudding would them boil away for a few hours before being hung to dry on the coat hook in our laundry (weird place, possibly, but it's probably the safest and where she's always hung it!) where it would dry out and mature until Christmas day before being boiled for a few hours once again on Christmas day. It's a classic recipe - but one that involved waaaaaaaaay too many steps and processes for me - so this recipe is way easier than that! Four years ago, when I had my first gluten free Christmas, I was devastated that I couldn't eat my Mum's Christmas Pudding. At the time, I couldn't even find gluten free bread crumbs in the shops and there was no way I wanted to make a giant pudding for just myself - so I got to experimenting. I decided rather than a boiled pudding, I was going to go with a fruit cake - so for the last four years I've been perfecting that recipe. The ingredients have always been the same, but it's the ratios that I've changed - and this year, I've come up with the perfect ratio. And then an entire mini fruit cake disappeared. 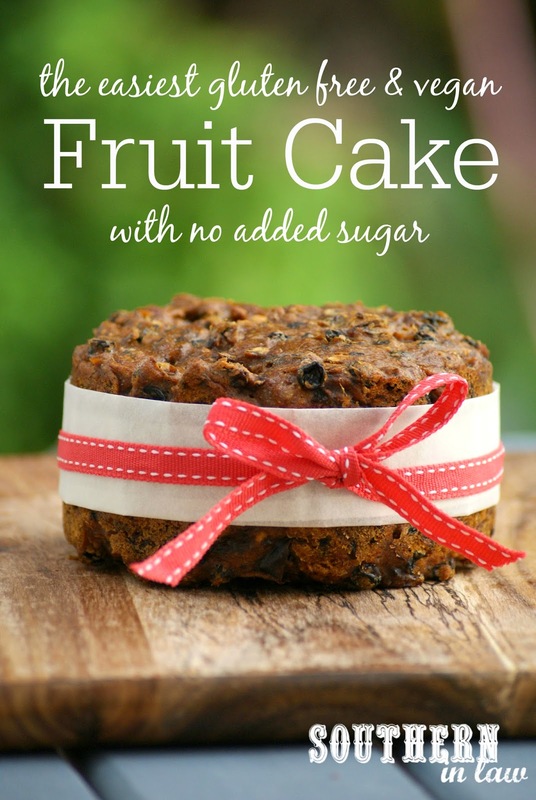 This fruit cake is so easy and so delicious that even my fruit cake hating husband loves it - and did I mention it has just three ingredients? Soak your fruit in your boiling water either overnight or for a few hours, covering your boil/container to trap the steam. If I forget to soak mine overnight, I'll simply start soaking it in the morning and make the fruit cake that afternoon. Once your fruit has soaked, preheat your oven to 125C/260F. Grease and/or line a large (~9-10") cake tin or 6-8 individual cake tins (we used small 5-6" cake tins so that we could share them with friends) and set aside. Mix your soaked fruit mixture with your flour, mixing until just combined. Pour your cake mixture into your tin(s), smoothing the surface with a spoon or spatula. Bake for 1 hour (for individual cakes) to 2 1/2 hours (for one larger cake) or until golden and a skewer inserted into the middle of the cake removes clean. Leave to cool completely before storing in an airtight container. The cake will keep for 3-4 weeks at room temperature, however, we always store ours in the fridge just to be safe. I can't eat citrus so mixed fruit is a no-no for me. 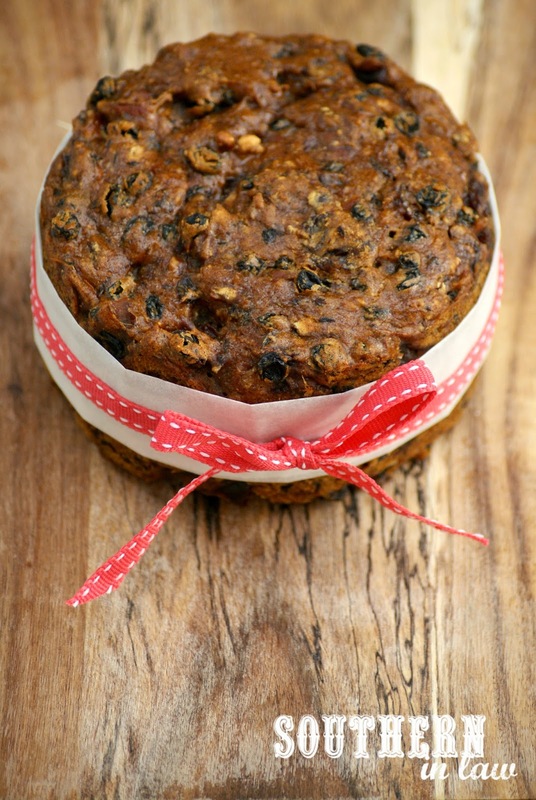 In my fruit cake I used 500g chopped dried dates, 250g currants and 250g raisins. 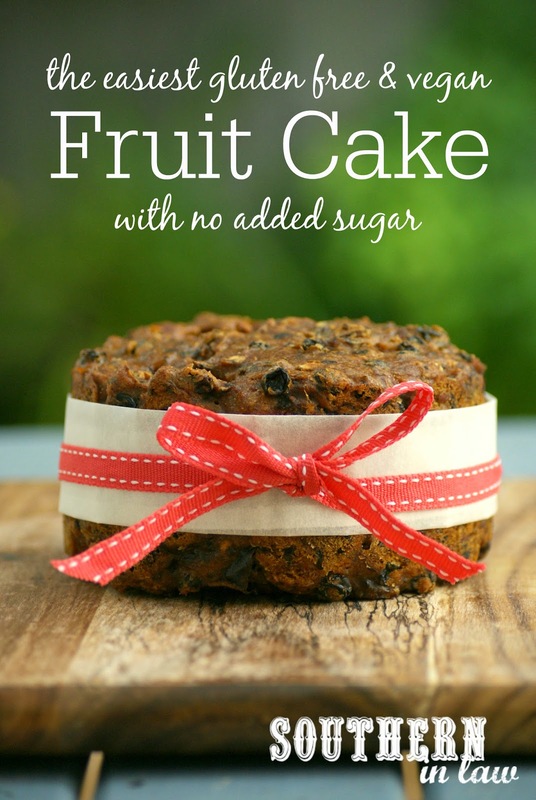 You may substitute some of the water with alcohol if you want a more traditional fruit cake! Chocolate desserts more your style? Click here for my 4 Ingredient Chocolate Fruit Cake Recipe. But tell me, does your family have any Christmas food traditions?